"Bittersweet's founders are big travelers. Everywhere they went, they'd pack their suitcases with chocolates they just couldn't find at home, until they started thinking: "Why do we have to go to so much trouble to get great chocolate?!?" Once they ran out of frequent flyer miles, they got desperate and opened Bittersweet. 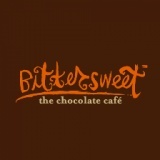 Bittersweet's mission is to bring the best the world of chocolate has to offer home to you. Have you ever been curious about chilis and chocolate? Got it. How about a bittersweet chocolate that you'd swear was infused with passionfruit? Got that too. Is milk chocolate your drug of choice? How about trying a vintage milk chocolate from Java?"